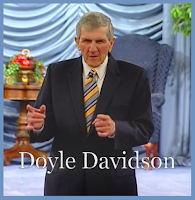 Join Doyle Davidson and Paul Peters on set today as Doyle begins by talking about what it means to be a “busy body.” Then he talks about one of the first messages he ministered at Water of Life about being “one heart and one soul.” And Doyle talks about how God blessed him when he was practicing veterinary medicine, even though he was in rebellion. Then he talks about the Roe v Wade decision and how the First United Methodist Church recently voted to stop its support of the decision. Then Kathie Davidson joins Doyle on the set and briefly talks about how life begins at conception. Then Kathie ministers about what it means to suffer, and how you will have to suffer if you want your faith to grow.